How Do I Test My Water for Lead? Although lead is rarely found naturally in water, there are some conditions that can lead to lead being found in the water used in a home for drinking, washing, and bathing. One way this can occur is through ground water contamination from substances such as paints and gasoline. Or, some older private wells and homes may have originally been built with lead components or pipes that have not yet been removed. If you are concerned about the presence of lead in your home’s water supply, the best way to alleviate your fears is to have the water tested by a professional. This technician should also be able to recommend a solution to your water problem, such as a whole-house water filter that can reduce the amount of hard metals found in your drinking water. Plus, you may find that the presence of lead is not the issue, but that there is something else causing your water problems, like hard minerals such as calcium and magnesium. 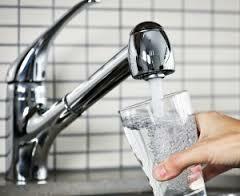 RainSoft is an industry leader in home water treatment solutions. An authorized RainSoft dealer can arrange to have a knowledgeable technician come to your home and perform a complimentary in-home water test. Once it is determined what problems are affecting your water – for instance, the presence of hard metals or hard minerals – the technician will then be able to recommend which water treatment system will work best depending on your water usage. To learn more about having a complimentary in-home water test performed, contact RainSoft today.